While I often go back to areas that I have photographed before, the Boardwalk at Daytona Beach is one that I have not been to in a few years. In the mid to late 1980s, when I was studying photography at what is now Daytona State College, I would often come to the Boardwalk to do what I thought of at the time as Garry Winogrand inspired “street photography.” I could count on the Boardwalk to offer a menagerie of people ranging from bikers, to college students, to retires, to homeless people, and to tourist. In the week after Bike Week and the week before Spring Break there would be bikers in the southern, older end of the boardwalk. This was popular with them as the pizza was cheap and the beer flowed freely. As you went north there would be an infusion of college students who, flush with their parents’ money would be staying and playing at the higher end hotels located toward the amphitheatre where there would be an assortment of contests including the ever popular, (at least with the males, but with the willing participation of the females) wet t-shirt contest. Both of these groups took advantage the warmth of spring and the fact that they were far from home. Over the years the Boardwalk at Daytona Beach had gone through several upgrades. It has long ago, even before I started to go there, lost it’s wood planking, replacing it with colored concrete imprinted with relief sea gulls and pelicans on the walkways that took you from the pier to the south and the amphitheater to the north. Despite these occasional upgrades, there was always a sense of tackiness and history to the place. Over time I photographed unsuccessfully the famous diving woman that was atop the swimsuit shop. There, as it had been for many years the saltwater taffy machine churning, what I can only guess, the same blob of taffy as I saw all those years ago. Many windows would be covered from floor to ceiling with tee shirts printed with sayings that one would not wear in public, except in Daytona Beach. Then there were the arcades with games that were so old they were last popular before the days of video games, offer tests of skill and manliness to those looking for an ice cream, hot dogs and a beer. However, for all its tackiness and questionable cleanliness, there was also a sense of tradition and history to the place. So despite its rather sorted charm, it was a popular location for both grizzly bikers and families with kids. The boardwalk always seemed somewhat sad to me. Here was a place to be a haven for fun in the sun, but no one seemed that happy. Workers seemed bored, fathers and mothers where short with their children, and teenagers trying to look cool in this somewhat seedy environment by trying to look both hip and aloof. Still it is my guess that they will go home happy with stories of time in the waves and with t-shirts that they cannot nor will not wear when they return home. I too came home feeling happy that I was still able to get some photographs as I did in 1986. 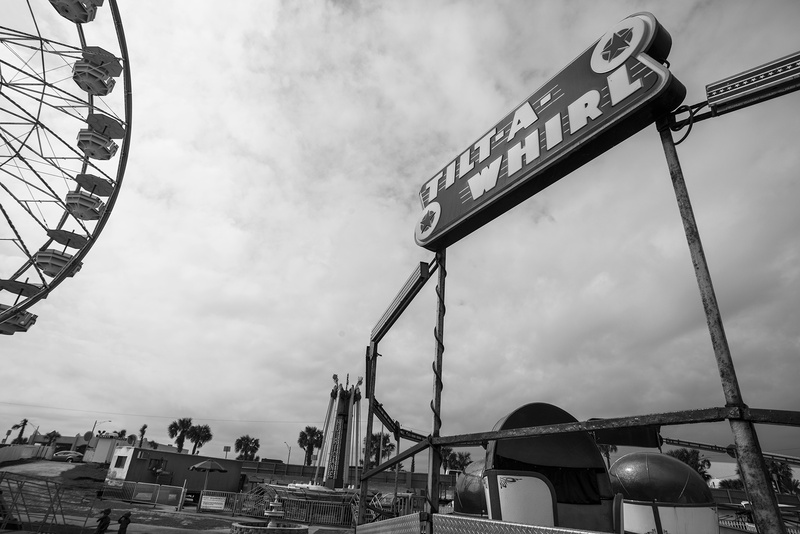 In the end, the Daytona Beach Boardwalk was in many ways like my memory of it, some things the same and some of it missing, but still with a sense of what it once had been. In his very worthwhile book, View from the Studio Door, Ted Orland wrote, “When it comes to making art, our intuition is often light years ahead of our intellect.” I know personally that when I am photographing I do not fully realize why I find a particular subject is meaningful. Most of the time when I see something that I want to photograph it is more a reaction to the scene rather than some deep thought about meaning. I feel that I make photographs using two levels of my mind. First is the photographer in me, who is thinking about F-Stops and Shutter Speeds, depth of field, and what direction the light is coming from. There is another side of me when I am making a photograph that recognizes something of the importance of what I am photographing. While in the act of making the photograph I do not think about why something is important, I just feel it and I have long go learned to go with those feelings. I may explain the meaning of a photograph later in writing or at a lecture, however the act of making a photograph is somewhat on auto, and I have to trust it. Trust is a good thing when you are an image-maker, because trust is, in many ways, the road to truth. It is the truth of an image what makes it both a personal expression and a universal one. 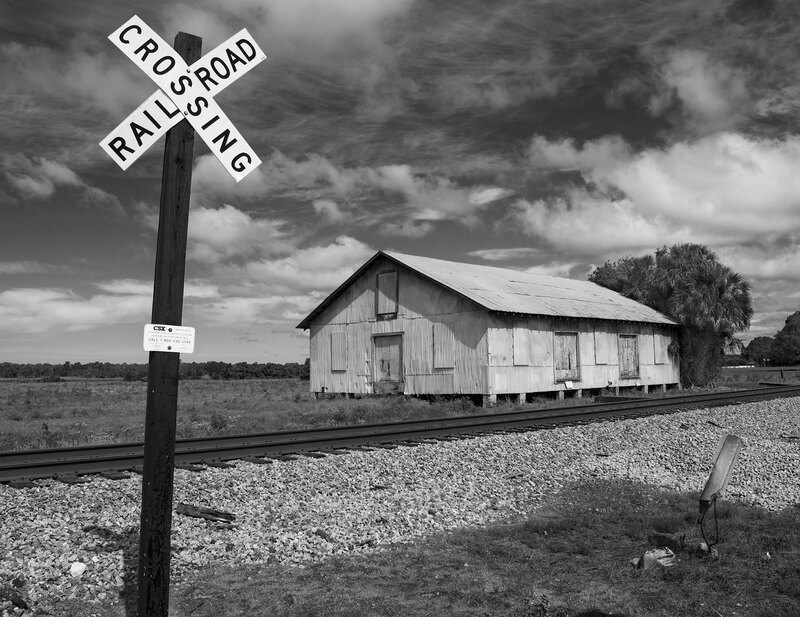 This past weekend I passed by a place that I had photographed before but wanted to again. The chicken restaurant opened in the early 60s. 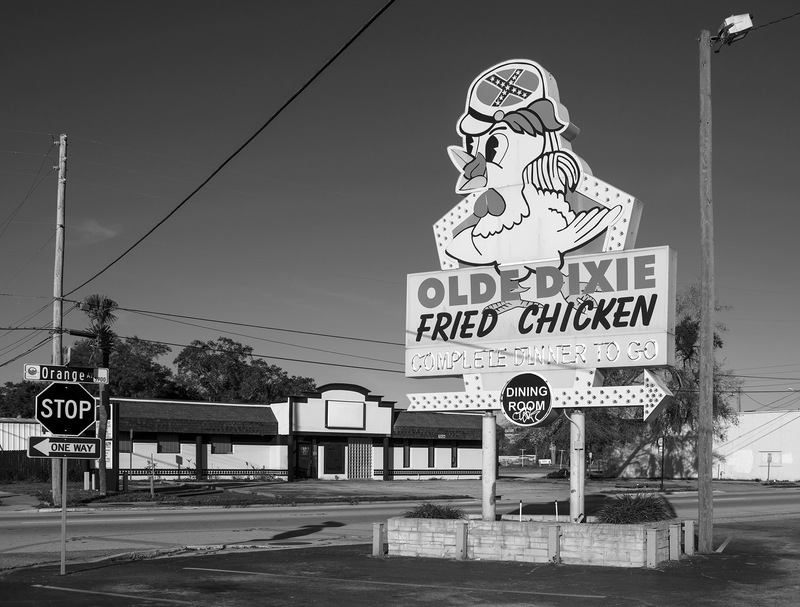 The name, Dixie Chicken alone might be enough to bring to mind some strong feelings about the dichotomy of a being proud of one’s heritage versus what that heritage means to some people. The chicken is wearing a Civil War era forage hat that has on it’s flat top the stars and bars that again represents a proud heritage to some, and the oppression of a people to others. It is that difference in the symbolism that defines the differences in the culture that I find interesting and why I was attracted to the sign. The symbolism of what signs means is deeper than what the sign says. If there is a connection between the two cultures it is cuisine and maybe that is the universal truth in the sign.